This fun gadget is a colourful, new version of the famous perpetuum mobile. Your desk will immediately look a lot less boring with this original decoration on it. Or maybe you could even use it during your physics class. This version perfectly shows how the law of conservation of energy actually works. 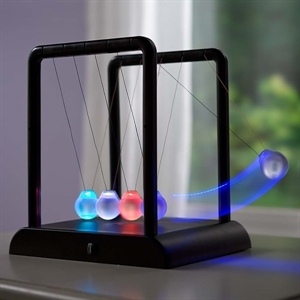 The balls that are in movement are red, the balls that stand still are blue. So you get to see the moving component turn red. This way a simple law of nature suddenly becomes a hypnotising spectacle. It uses LED lights that you can set to three different modes: flash, fade or colour cycle. And It's easy to put together yourself - all you need to do is click the rails in place.